Finally saw P.S. I Love You.. and I don't like it. Not one bit. I think it's a disgrace! (okay, that was mean) But I really don't like it. If it was meant to be an adaptation of the book that I love.. I say that it's a BAAAAD adaptation! But I'd talked to someone who had seen the movie without reading it first and he happens to like it. Ah well.. if you find yourself liking it, obviously you haven't read the book. Something a tad random: Dida thinks I don't know myself as well as I think I do. Apparently at my age, I couldn't possibly know myself. I don't know.. heh! Okay, maybe she's right. Saw this when I was going up the stairs to my house. 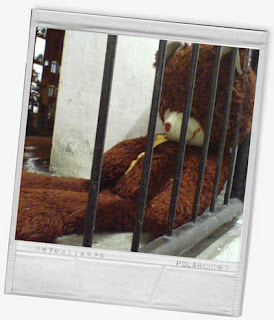 Very sad teddy bear.. left outside in the cold rainy night. it took me 6 hours and 12 minutes to finish writing this entry! hahahha!